NEW YORK — Wal-Mart's vast fleet of stores and its online business are starting to click together. The company raised its earnings outlook for the year on Thursday and delivered strong profit and sales for the second quarter, as moves to improve the store and online experience are winning over customers. Wal-Mart has launched a flurry of changes, from making sure vegetables look good to cleaning up the stores to being sharper on keeping prices low. It's melding online services with the stores — rolling out a mobile payment system to speed checkouts. And it's pressing ahead with online grocery and pick-up services. As a result, the Bentonville, Arkansas-based company reported its eighth consecutive quarterly increase in comparable-store sales, and the seventh straight quarterly gain in customer traffic at its Wal-Mart U.S. namesake business. "We've got existing customers who are visiting stores more often and putting an extra item in their basket," Greg Foran, CEO of Wal-Mart's U.S. business told reporters on a call Thursday. Wal-Mart is also picking up some new customers, but that will take some time, he added. And growth was solid and consistent across all types of merchandise from toys to clothing. Wal-Mart shares rose 1.3 percent to $74.29 in late morning trading. Like its direct store rivals, Wal-Mart is reinventing itself to be more nimble as it tries to fight off competition. In particular, it's trying to compete with online leader Amazon.com, whose Prime shipping program is swiftly converting members into loyal shoppers. And it faces competition from dollar stores and traditional grocers like Kroger, which are ramping up promotions and lowering prices. The report contrasts with results from Target Corp., which cut its profit forecast Wednesday as customer traffic fell for the first time in a year and a half. Target blamed a number of factors. That included that it focused too much marketing on its stylish merchandise and didn't do enough to bring in customers looking for essentials like detergent. It's also struggling to reinvent its food section and it also cited weak electronics sales. Target CEO Brian Cornell also noted sales varied widely from region to region. Wal-Mart, meanwhile, is vastly expanding the items available on its website, and global online sales rose 11.8 percent in the second quarter. That's up from the 7 percent pace of the first quarter but still far weaker than the 20 percent increases from less than two years ago. It's also spending $3 billion to acquire fast-growing online retailer Jet.com, which it says will help it grab higher-income and younger customers. It will incorporate some of Jet.com's technology that lowers prices in real time. 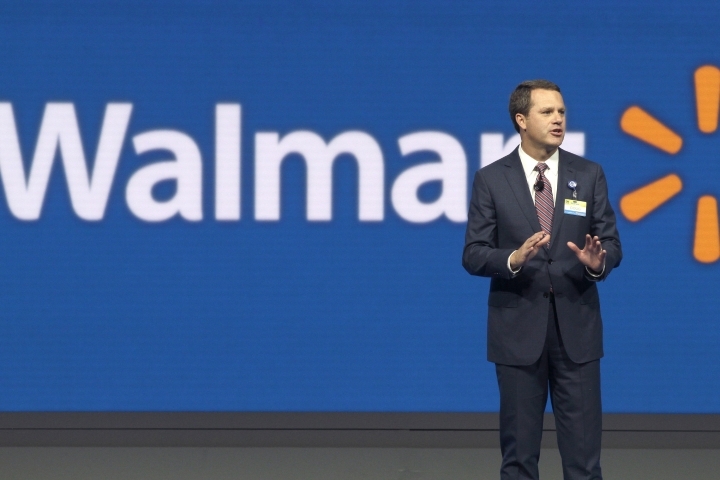 Chief Executive Doug McMillon said in a pre-recorded call that the growth in global e-commerce came from the improvement in the U.S. market, fueled by its rollout of Wal-Mart Pay and the online grocery and pick-up services that it's rolling out. The company added grocery pickup service to 30 more markets in the second quarter, bringing the total to more than 60. The grocery business showed improvement from the first quarter despite inflationary pressure. Both general merchandise and health and wellness items showed solid sales growth. Second-quarter net income jumped nearly 9 percent to $3.77 billion, for $1.21 per share, in the quarter ended July 31. That compares with $3.47 billion, or $1.08 per share in the year-ago quarter. Earnings adjusted for non-recurring gains were $1.07 per share, a nickel better than Wall Street had expected, according to a survey by Zacks Investment Research. Revenue was $120.85 billion, also edging out analyst forecasts. Revenue at U.S. Wal-Mart stores opened at least a year rose 1.6 percent, its best performance since 2012. Customer traffic rose 1.2 percent, marking the seventh straight quarter of gains. The U.S. Wal-Mart division accounts for 62 percent of total sales. The company now estimates that for the current fiscal year, adjusted per-share earnings will be $4.15 to $4.35. Analysts had expected $4.27. Wal-Mart is also spending $2.7 billion on higher wages and other investments for its hourly workers over a two-year period. The company also just rolled out a new system in about 650 Neighborhood Market stores that gives hourly workers more certainty about their schedules. Wal-Mart says lifting wages, which has turned into a contentious issue for a number of major U.S. restaurant chains and retailers, will lead to a more solid workforce that can better serve their customers.